I will be the first to admit – one of the worst things ever is moving. Like I must really really love a house (or hate the one I’m living in) to decide to move. It’s a lot of work, especially if you have more than just yourself to move – or if you’ve lived in a house for ever and collected a ton of stuff. There are some things however, that you can do to make the whole process a bit easier – and making your move a success! Get Rid of What You Don’t Need – moving is a perfect time to purge your home. You already have boxes, and probably a truck to help you move, so be sure to take a load to Goodwill or your local charity. You will be glad you did! Purging your house now will save you time -and room – in your new place. It’s like killing 2 birds with 1 stone! Clean – clean the old place, and the new place. Just get it scrubbed down from wiping down the cabinets to cleaning the carpets. Get it done while you are packing, that way you don’t have to worry about it during moving day. Keep Organized – make sure you have plenty of boxes, markers, bubble wrap, plastic wrap, etc. and pack smart. Mark boxes with which room it should go in as well as what specifically is in each box – trust me, you will be glad you did. Mark Certain Boxes with a Star – these boxes are things you will need as soon as you move. This is shampoo and soap and towels so you can shower – sheets and pillows and blankets so you can sleep – bowls, silverware, dishes, cups, pans, – so you can make dinner. You don’t want to go rummaging through boxes to find what you need to get a shower before bed when you are already exhausted. Fix, Repair, and Replace – whether you rent or own, when you are moving out or moving into a new place, something usually needs fixed, repaired or replaced. This can be blinds (which seems to be an issue for everyone), toilet paper, light bulbs, and especially air filters. I’ve mentioned before about the great deals I get at Sam’s Club, and during a move that is about the only place I go (I can even buy boxes there), but they have great deals on essentials like 3M Filtrete air filters. 3M Filtrete filters are $8 off now through November 25th with Sam’s Club Instant Saving! 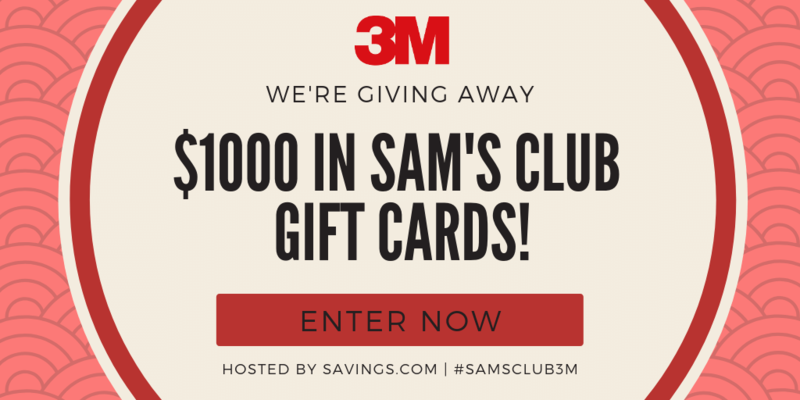 10 winners will receive a $100 Sam’s Gift Card! This ends Friday 11/16, so hurry and enter now! This entry was posted in Cleaning & Organizing, Reviews/Giveaways. Bookmark the permalink.